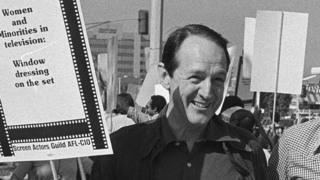 Veteran actor William Schallert, who was best known in the US for his roles in The Many Loves of Dobie Gillis and The Patty Duke Show, has died aged 93. He appeared in everything from Star Trek to the Oscar-winning film In The Heat Of The Night, as well as serving as president of the Screen Actors Guild from 1979 to 1981. Most recently, he guest starred in Desperate Housewives and True Blood. His son said that he died at his home in California. A cause of death has not been specified. Born in 1922, Schallert appeared in numerous hit shows in the 1950s, 60s and 70s - including Hawaii Five-O, Gunsmoke, The Waltons, Bewitched, Quincy and Bonanza - but began his career on stage at university, where he was directed in a production of Somerset Maugham's Rain by Charlie Chaplin. He appeared as the dad in 104 episodes of The Patty Duke Show, as well as the TV movie reunion in 1999 with other original cast members including Duke herself. In later years Schallert added the likes of My Name Is Earl, How I Met Your Mother, 2 Broke Girls and Medium to his impressive CV. On the big screen, he had roles in many films, including the 1959 Rock Hudson and Doris Day romcom Pillow Talk, the 1968 Elvis Presley musical Speedway and 1987's sci-fi comedy Innerspace. For Trekkies though, he will always be Nils Baris, the Federation official that discovered the furry aliens in the classic and much-loved 1967 episode, The Trouble With Tribbles. More than four decades after his appearance on the show, he was still in demand at Star Trek conventions. As president of the Screen Actors Guild - an honor held by, among others, Charlton Heston and Ronald Reagan - he said that his greatest accomplishment was the formation of a committee for performers with disabilities.